Many, many thanks to our generous and kind sponsors who support field trialing and allow the Invitational Championship to be recognized as one of the top championship titles in the nation. RU – Midwest OSD CH 53 x 5 = 265 1,245 pts. 1st – Lone Star OSD CL 41 x 10 = 410 3,930 pts. 2nd – Garden State OSD CL 47 x 5 = 235 2,855 pts. RU – All-American OSD CH 62 x 5 = 310 2,240 pts. 3rd – Beaver Creek OSD CL 36 x 3 = 159 2,094 pts. 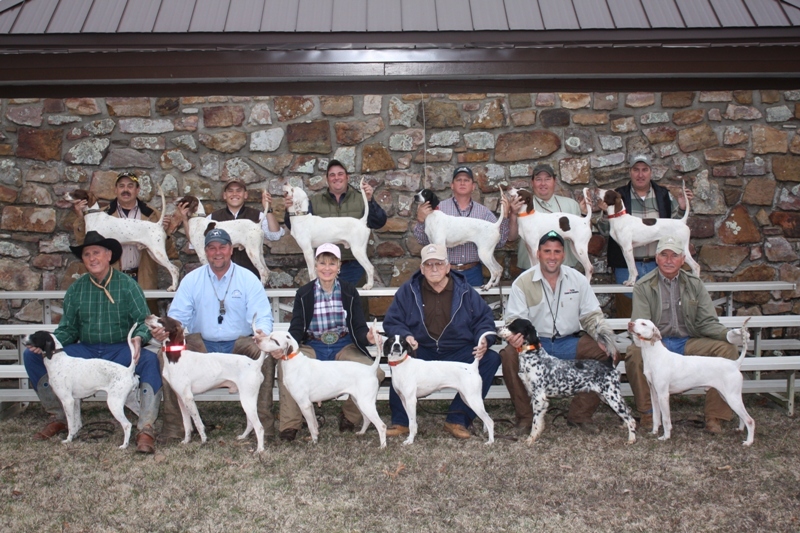 3rd – NC Open Pointing Dog Assn. 56 x 3 = 168 1,388 pts. 3rd – Spartanburg FTC / Kilgore OSD CL 44 x 3 = 132 1,167 pts. 1st – Garden State OSD CL 47 x 10 = 470 1,040 pts. 3rd – Garden State OSD CL 47 x 3 = 141 856 pts. 2nd – Bama Quail Club OSD 50 x 5 = 250 740 pts. If you are interested in watching the country’s top twelve Purina Points Earning Shooting dogs compete for three grueling days at one of the circuit’s premier field trial facilities or watching the country’s best shooting dog handlers showcase their talents and the talents of their canine competitors, then I recommend you attend the United States Shooting Dog Invitational Championship. The U.S. Shooting Dog Invitational Championship, held at the Camp Robinson Wildlife Management Area near Conway, Arkansas, is a unique three day endurance shooting dog event in which the top twelve Purina Points Earning Shooting Dogs compete for one hour on the first two days, and then if they earn the opportunity to make the call back, they must compete for an hour and one-half in the final series. The best analogy to describe the grounds at Conway is breath taking. This area provides a wide range of varying habitat that is groomed to absolute perfection and is ideal for the many coveys of quail that reside on the area. The area managers and wildlife technicians have worked tirelessly, with the field trial contingency, to create a successful environment for the early and late season quail restoration programs. Prescribed burning and mowing programs in conjunction with the agricultural farming practices yield the proper habitat for both wild and pre-released quail to survive. The intermittent hardwoods and thinned pine stands are prevalent throughout as they are strategically intermixed with agricultural areas and native grasslands. Grain products such as soy beans, milo, and wheat are abundant in the many food plots as they supplement the year round feeding program. This combination of proper habitat management, strategic agricultural practices and the supplemental feeding program have proved successful over the past several years and is directly correlated to the overall success of this event. This year’s judges, Jerry Hailey of Buffalo, MO and Tommy Liesfield of Waynesboro, GA filled in for the originally advertised Mike and Rick Furney. These two gentlemen were quite the pair. Jerry’s gentle, deep voiced, quiet personality was a great compliment for the ever entertaining, full of life personality of Tommy Liesfield. Both individuals carry the field trial credentials necessary to look at the caliber of dogs this trial boasts, and they have the knowledge necessary to evaluate a championship performance. Jerry is a highly successful professional shooting dog trainer while Tommy has been successful campaigning dogs in the amateur and open all age ranks. The two cohorts maintained a steady pace, looked at every dog the same and rode hard for three days. I looked forward to the end of the day and the many stories they provided. I will never forget Tommy Liesfield’s, “The Most Scared I’ve ever Been” story as long as I live! This year’s 2011 U.S. Shooting Dog Invitational Championship was nothing short of amazing. There were great performances, legendary handlers in attendance, large galleries, extravagant meals and fierce competition between the country’s top shooting dog handlers. Judges Jerry Hailey and Tommy Liesfield named Great River Ice or “Dan” for owner Brian Sanchez of Central Islip, NYand handler Mike Tracy of Glenville, PA the 2011 champion. Brian Sanchez purchased Great River Ice as a puppy in the spring prior to his derby season from Mr. Scott Crawford of Overland Park, KS. Mr. Sanchez immediately placed him into the able hands of trainer Mike Tracy for his further development and breaking process. Mike Tracy credits Scott Crawford for the pup’s early development and having the proper foundation when it arrived in Pennsylvania. Mike stated that Dan had a good front end established and would flash point birds and hold them until you got there to flush. Prior to the United States Shooting Dog Invitational Championship, Dan had earned a runner-up championship and several shooting dog classic wins. He was the #12 Purina Points earning Shooting Dog accumulating 856 points to earn his invitation to the Championship. Great River Ice put down three performances that can be best described as intelligent, gritty, determined, strategic, strong and stylish. Throughout the three performances, Mike and Dan were a team that got stronger and more confident with each other. Dan ran in the 5th brace on Day 1, the 2nd brace on Day 2 and the initial series of the finals. He carded 6 finds throughout the three days and rarely had to be scouted. Dan’s intelligence allowed him to adapt with each course and find birds on varying terrains. He seemed to always be on the front end and was very biddable throughout the 3 ½ hours. His birds were properly located, and his style was captivating on each stance. Simply put, Great River Ice is a true endurance champion, but first and foremost he is a great bird dog! The United States Shooting Dog Invitational Championship is professionally orchestrated by a team of highly skilled individuals. Johnny and Joyce Taylor and Johnny and Rita Ornsby have the event streamlined and managed like a professional business. Each party knows their roles and how to manage a major circuit championship. Each and every day, the trial ran smoothly. The lunches and dinners were properly planned, and the evening events were very entertaining. Johnny Taylor worked hard as the trial chairman with his wife Joyce handling the majority of the secretarial duties. Also Joyce and Rita, along with Connie Crowell, handled the marshaling and the lunch/dinner management. Rita donated several beautiful, handcrafted, wood sculptures for the owners. Johnny Ornsby worked behind the scenes to provide and care for the judges, the reporter, and handlers. He also cooked the steaks for the Sunday evening meal and was aptly dubbed “The Grill Master of Arkansas.” Art Crowell managed the road gallery and ran any necessary errands the girls needed. In speaking with these folks, it is apparent the preparation for this event is a year long project with its culmination taking place in three short days. I would like to thank this team for their hard work and tireless dedication. After speaking with many of the owners, handlers and participants, the hard work and dedication that the Taylors, Ornsbys, and Crowells provide does not go unnoticed and many feel this is the country’s best field trial event. The United States Shooting Dog Invitational Championship has over 25 sponsors and four Invitational Benefactors. The sponsorship package for the winning handler includes a $7,000.00 purse, an Astro Garmin Unit, a Pro 500 Tritronics training collar, and 500 pounds of Purina dog food. The winning owner’s prize package includes a Ross Young original oil painting of the Champion which is sponsored by Purina and Spalding Labs, an Astro Garmin unit, a Montana Silversmith Belt Buckle from Gordon and Cindy Hazelwood, and an original Rita Ornsby handcrafted wood carving/sculpture. After the Saturday evening meal, Ross Young along with Roy Pelton, representing Purina, and Larry Garner, representing Spalding Labs, was on hand to present Dr. Richard Steckley with the beautiful oil painting of the 2010 U.S. Shooting Dog Inv. Champion – Ninnescah Nicole. Also, Rita Ornsby presented Dr. Steckley with a handcrafted shooting box that had a wood carving of Ninnescah Nicole on the inside lid. On Sunday night, the owners and handlers were treated to many prizes such as more wood carvings, e-collars, equine equipment, Spalding Lab Certificates, Gun Dog Supply Certificates, American Field Publications, Sport Dog Hats, Tech Mix and Nutramax Products, and the highly coveted Cagle Saddle Company saddle bags. The ladies (owners) were also treated to a surprise and presented with handcrafted Julie Martin Belt Buckles. A special thanks goes out to each and every sponsor. Without their kind and generous support, this event would not be possible. The Friday evening festivities consisted of a happy hour and then a wonderful barbeque supper. After the meal, Johnny Taylor and the U.S. Shooting Invitational team conducted the drawing for the Saturday and Sunday braces and then took time to introduce the owners, handlers, judges, celebrities and sponsors in attendance. Also, they presented the owners, handlers, judges and reporters with the complementary United States Shooting Dog Invitational hats and jacket. Furthermore, each handler was presented with complimentary products from Leather Brothers, Gundog Supply and Purina. Each owner received a commemorative book. It was a great way to break the ice and meet all the participants at the event. Nervous energy and anticipation filled the air as 43 gallery participants awaited the first brace. Under overcast skies and temperatures in the mid-50’s, the handlers unloaded dogs from the dog wagon as Johnny Taylor conducted the morning announcements. Drawn to run in Brace 1 was the 2007 U.S. Shooting Dog Inv. Ch. Serious Threat (Joe) handled by Mike Tracy and scouted by Mark McClain and Erin’s Little Engine (Ben) handled by Luke Eisenhart and scouted by Shawn Kinkelaar. Serious Threat’s owner, Greg Strausbaugh, and his friend Barbara Wharton were riding in support. Turned loose at promptly 8:00 a.m. both dogs were away to the front. At :09, Luke had his hat in the air calling point for Little Engine on the left of the course. Little Engine appeared to have a feeding covey pinned out in the open, but the stand and relocation proved unsuccessful. Back to the front at :15, Little Engine was again found standing along a sparse wooded edge. Once again the birds had left Little Engine, but as Luke was collaring his dog, Judge Liesfield rode up the covey while leaving the stand. At :30, both dogs topped the mountain, and the handlers gathered them up for a drink. Through the Cat Crossing at :40 with both dogs shooting down the right edge, point was called again for Erin’s Little Engine. This time, Ben had the birds pinned in a milo feed strip near the lake with all in order for flush and shot. After traversing through a hardwood stand and near a known feed location, Mike Tracy called point for Serious Threat. Joe had his own covey of birds located with all in order for the bird work. Shortly after, Little Engine suffered another unproductive and was put in the harness. Serious Threat finished his hour going away and getting stronger when the judges called pickup. Covey Rise’s Offlee Amazin (Braxton) handled by Shawn Kinkelaar and scouted by Eddy Taylor was brought to the line with Gypsy Elhew Hannah (Hannah) who was handled by Jason Williams and scouted by Luke Eisenhart. Owner Gary Hertz was riding in support of Offlee Amazin while Jessica and Jamie Fisher had made the long trip from Colorado to watch their Hannah dog compete. The dogs broke away at 8:15 a.m. with both dogs making a forward swing under overcast skies and temperatures climbing into the low 60’s. At :23, the pair was gathered at the morning mountain crossing and watered. The pair was doing a nice job with Hannah showing more biddability and Braxton pushing the outer limits of the course. At :30, Offlee Amazin disappeared from the front and scout Eddy Taylor was dispatched. With Braxton making a wrong turn, Hannah took advantage of having the course alone and showed her talents hunting at a nice range and staying on the front end for handler Jason Williams. At :42, Braxton returned and was back to the front again. Shortly after, Offlee Amazin was found standing along a thick bi-color strip. His head was elevated indicating the birds were a long ways off. After a long flushing attempt, a single was produced. At :49, Jason called point for Hannah on the right side of the course near a dense thicket. Since Jason’s initial flushing attempt could not produce the birds, Hannah was asked to relocate, and she did with ease. She went right to them and pinned a running covey. Both dogs finished well to the front as pickup was called at 10:15 a.m.
Hardup Road Jessie (Jessie), handled and scouted by the husband and wife team of Doug and Lea Ray, was braced with Erin’s Backstreet Affair (Mae) handled by Luke Eisenhart and scouted by Jason Williams in Brace #3 on Saturday morning. The dogs broke away as temperatures remained moderate with the sun trying to peek through the clouds. Breaking away down the right edge of the course, this pair of dogs took to handling kindly while pushing the limits of the front end. At :21, Jessie was on the board with a large feeding covey pointed in a prairie grass flat. As Doug flushed, her stance remained motionless, and she showed impeccable style throughout the bird work. Four minutes later, Erin’s Backstreet Affair had her own birds located but required a relocation to get them pinned before making their escape. A single was produced, and all was in order for flush and shot. From there, neither dog found birds the rest of the hour but displayed very attractive shooting dog applications. During the last :15, both of the dogs were very strong with Affair being a little more aggressive but Jessie showing the extreme animation in her search. As temperatures rose into the upper 60’s, Hot Topic (Shay) handled by Shawn Kinkelaar and scouted by Eddy Taylor was brought to the line with The Insider (Spec) handled by Luke Eisenhart with Jason Williams scouting. The Insider is a beautiful tri-color setter male and the only setter to compete at this event. Bill and Mary Anne Sand were in attendance with Bill riding in the 30 person gallery to support their Hot Topic female. Breaking away at 1:07 p.m., both dogs shot forward and applied themselves well. They were running an extremely attractive race with Hot Topic really doing a nice job for Kinkelaar as Spec required more assistance from Luke and Jason. At :32, both dogs were by the Cat Crossing and gathered up for a drink. At :40, Topic was found standing by scout Eddy Taylor near an oak flat. The call of point brought Kinkelaar from the left side riding hard to the stand. A short flushing situation proved successful as the large covey took flight. As the brace went on, Spec’s application improved, and he became more applicable during the last fifteen minutes. At :52, both dogs made the U-turn, and at pickup, the Insider was seen going dead away with Hot Topic taking in country on the left side of the course. Both dogs finished well as they each improved throughout the brace. Scout Mark McClain led Great River Ice (Dan) to the starting line for Mike Tracy. 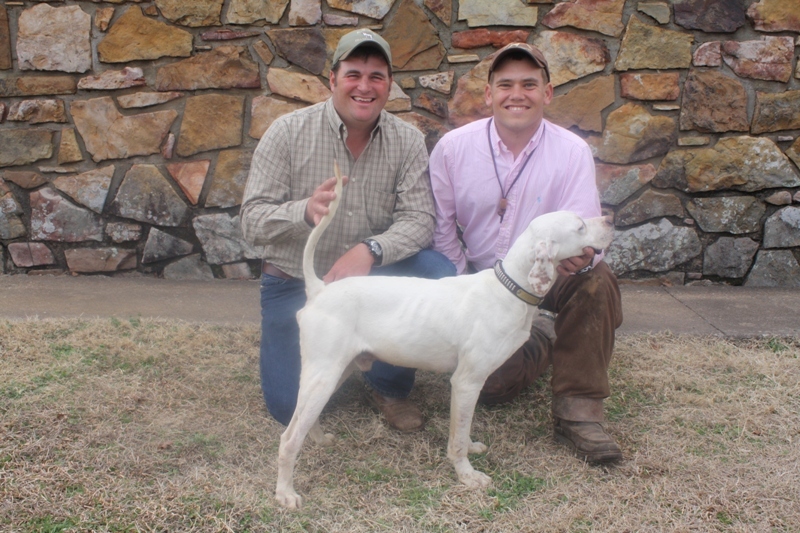 The big white and orange male pointer was braced with Bill Merrifield’s Merrihill’s Carolina (Bette) which was handled by Shawn Kinkelaar and scouted by Eddy Taylor. The pair broke away at 2:18 p.m. at the gravel road crossing. Immediately, Great River Ice whirled to establish point just off the breakaway on the right side of the chute. Mike Tracy produced a large covey for the stylish pointer as Dan remained staunch for flush and shot. Dan’s style was captivating as the large gallery seemed to huddle around to watch the bird work. At :33, both handlers elected to water near the dry lake bed area, and at :40, Dan was on the board again with his second find. At :48, both dogs suffered separate unproductives on different stances. With 5 minutes to go, Great River Ice punctuated his performance with his third and final find just after the double creek crossing in a small cottonwood grove. Pickup was called at 3:18 p.m.. Merrihill’s Carolina finished her hour well as she went to the right places but suffered one unproductive. Dan on the other hand, finished strong with 3 finds, 1 unproductive and got better throughout the entire brace. The final brace on Saturday afternoon featured Buffalo Creek (Mac) handled by Mike Tracy and scouted by Mark McClain with Ninnescah Nicole (Nicole) handled by Chuck Stretz and scouted by owner Dr. Richard Steckley. Breaking away at 3:27 p.m. in a small native grass stand, both dogs were away with vigor as the skies regained some cloud cover and temperatures began to cool. At :15, just over the knob near the lake, both dogs were found standing with Nicole pointing and Creek backing. A long extended flush proved unsuccessful and both dogs were taken on. By the double red gates at :21, the handlers pointed their dogs out on the front end hunting nicely and going to the likely places. At :31, the dogs crossed over the knob by the old deerstand and entered the burnt pine grove. The pair was getting stronger, and their pursuit was intelligent. They handled well and finished strong as pickup time was called. After a wonderful catfish dinner, artist Ross Young presented last year’s winning owner, Dr. Richard Steckley, with a beautiful painting of CH. Ninnescah Nicole. Ross briefly described the setting and his inspiration behind the painting. He decided to place Nicole in a setting that depicts many of the beautiful covey haunts on the Camp Robinson grounds. During the presentation, Roy Pelton from Purina and Larry Garner with Spalding Labs discussed their support of the United States Shooting Dog Invitational Championship and expressed their congratulations to last year’s winners. Several local Arkansas celebrities were on hand to enjoy the festivities and evening camaraderie, but none more enjoyable than former legendary pro trainer Bill Trabue. He entertained many of us with great stories of his field trial champions of the past. Once again, announcements were made as the competitors taped feet, prepared tracking collars and brought dogs to the line. It was announced that the Arkansas Game & Fish T.V. crew would be on site in the afternoon to do some filming. Local pro trainer Gordon Hazelwood would be conducting a dog training demonstration for the program, and the crews would be filming portions of the trial from strategic locations. Promptly at 8:02 a.m., Buffalo Creek for Mike Tracy and Merrihill’s Carolina for Shawn Kinkelaar broke away to the front down the chat road. Shortly after, deer were seen leaving the area as the handlers quickly gathered their dogs up. At :26, the dogs crossed over the mountain and were sent forward down the left edge. Carolina was making some big swings but purposefully checking in. As the pair veered south along the hardwood timbers, they passed along the Cat Crossing. Before long, the call of point rang out and we found Carolina, head elevated, standing beautifully posed on a pine knoll near a bi-color strip. A long flushing attempt and several relocations proved unsuccessful. At :55, Merrihill’s Carolina was put in the harness after suffering her second unproductive. Buffalo Creek finished the brace without birds, but put down a very strong pursuit throughout his hour. Great River Ice and Ninnescah Nicole were loosed at the double black culverts under overcast skies and increasing winds. Both dogs took immediately to hunting with Nicole grabbing the wheat field edge on the left and Ice navigating the hardwoods stand out front. At :10, point was called near a small draw on the left hand side of the course with Mike Tracy calling the flight of the birds as the judges arrived. With the birds not being seen under judgment, Mike fired his gun and decided to take his dog on. Within minutes of releasing Ice, Mike had his hat in the air again 200 yards out front. The entire gallery was treated to a spectacular piece of bird work out in the open near the base of the mountain. A large covey was produced, and all was in order. At :20, both dogs were found standing in the far right hand corner of the course near the lake. Mike Tracy explained to the judges his interpretation and elected to take a back. Chuck decided to flush, then relocate and let his champion bird dog hunt the area. After several minutes, Nicole was unable to pin the covey, and she was taken on. At :30, both dogs were up front again canvassing the burnt hardwood timbers and making very intelligent swings. With 9 minutes remaining, the handlers watered at the gravel road and sent the dogs forward towards the lake country. Both dogs finished strong and to the front. Although Nicole went birdless, it was not for lack of effort. Her effort could best be described as ideal as she canvassed the countryside and remained in constant contact with her handler. Ice once again went bird hunting. His hour was without fault and consistently forward. He improved throughout, as he adapted from edge country around the lake to the hardwood stands near the mountain. As was his first, his second hour was of championship caliber. Hot Topic was by herself in Brace 3, as she broke away near the dry lake bed. Taking the left edge through the intermittent hardwood timbers into the native grass stands, Topic was found standing at :13. Shay had a nice covey pinned under a pair of burnt pines. From there she shot forward and went to hunting nicely. She was handling kindly and was working hard. At :30, she was on point again. This time her stand proved unproductive, and she was taken on. Down along the edge of the lake and crossing over the pine knoll, Topic passed the double red gates. At :37, at the end of a long brushy draw, Shawn called point for Topic. Riding to the find, Shawn called flight of the birds, but they were not seen under judgment. Shawn fired and Shay was taken on. Shortly thereafter, Shay was found standing at :43. A rabbit was produced, and she was again off. Pickup time was called at 11:31 a.m. as the temperatures warmed. Hot Topic’s hour was very consistent, smooth and reaching. She finished well to the front and still working hard at pickup. Brace 5 brought a pair of very nice females to the line. Gypsy Elhew Hannah and Hardup Road Jessie were away at 1:12 p.m. just below the parking lot with conditions remaining overcast, windy and warm. At :10, Jason Williams called point for Hannah as she was found standing with a nice covey pinned under a lone oak tree. From there she was sent forward through the hardwood cut and traveling east. At :12, Jessie made a wrong turn and was not seen under judgment again. Across the mountain at :27 and down hill towards the pine stands through the cat crossing, Hannah’s pursuit widened. She was gaining strength as she traversed along the lake and through the grasslands. At :58, Hannah had a stop to flush just after crossing the knob. Pickup time was called as Jason watered. At 2:25 p.m., Erin’s Backstreet Affair and Serious Threat broke away at the road traveling along the base of the mountain. Point was called but waived off eight minutes into the brace. At :35, Serious Threat was on point with Affair backing. An unproductive was charged, and the dogs were taken on. Same scene at :40 with the same result. At :45 though, Serious Threat redeemed himself as he had a true “limb find” near the left lake edge. A nice covey was put to flight, and all was in order. Backstreet Affair was on the board at :49 with a nice covey along the right side of the course. By the monument and parking sign at :52, Threat was seen zipping up the right edge with Affair punching through the cover on the left. Serious Threat was on the board again at :59 after a lengthy relocation produced birds. Pick up time was called during the bird work. This was a very fun brace to watch with lot’s of action and both dogs applying themselves well. They were consistently forward and used the limits of the course to find birds. The last brace on Sunday brought Covey Rise’s Offlee Amazin to the line by himself. At 3:36 p.m., heading towards the lake at the road crossing, Braxton charged forward. At :03, he raced by the clubhouse and across the knob where Buffalo Creek and Nicole were found standing. From there he navigated over the mini-mountain and entered the bottom country of the 3rd hour course. Offlee Amazin was running a beautiful race as he checked all likely locations. At :31, Braxton was rewarded as he was found standing in a small covert on the right hand side of the course. A lone single was produced, and all was in order. At :36, it seemed as Offlee Amazin was getting stronger as he made a big swing along the residential area and then below camp and by the black barrel at :52. Pickup was called at 4:36 p.m. His finish was strong down the right edge and deep to the front. Prior to dinner, a moment of silence was conducted for long time field trial patron Roland Kane. 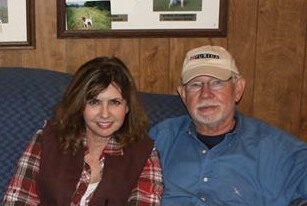 Roland was a long time supporter of theTracy family and a dear friend and mentor to Mike Tracy. In talking with Mike about Mr. Kane, I learned that Mike thought of Roland more as a friend than a client. Mr. Kane will be deeply missed! Dr. Richard Steckley provided the steaks that Johnny Ornsby so deliciously cooked for the Saturday evening dinner. After dinner Johnny Taylor made the finals announcements. Judges Liesfield and Hailey named Great River Ice and Erin’s Backstreet Affair in Brace 1 with Covey Rise’s Offlee Amazin and Hot Topic placed on standby. Both judges did acknowledge that Serious Threat made a strong bid to make the callback too. Once the announcements were complete and the congratulations in order, the owners and handlers were presented with numerous prizes. Also, everyone was blessed with the presence of Delmar Smith, Field Trial Hall of Famer from Oklahoma. There were 27 riders in the gallery to witness the finals of the 2011 United States Shooting Dog Invitational Championship. Mark McClain scouting for Mike Tracy led Great River Ice to the line as Jason Williams helped Luke Eisenhart prepare Erin’s Backstreet Affair for the 90 minute finally. Temperatures were mild in the mid 50’s, with overcast skies and 10 to 15 M.P.H. winds as a front appeared to approach. Johnny Taylor conducted the final announcements as the dog’s were turned loose at 8:01 a.m.
With his feet taped, Great River Ice broke away to the right with Erin’s Backstreet Affair grabbing the timberline to the left. At :04, point was called just past the second cut through with Affair pointing and Ice backing. A covey of birds were put to flight with all in order. From there, the pair took the waterway turning back towards the Game and Fish House. By the burnt pine stand and prior to making the mountain loop, Ice was on the right edge with Affair grabbing the left. At :23, point was called along the road with Affair standing tall and proud. After a long flushing attempt, Luke asked Mae to relocate. During the relocation, while Luke was trying to get out of his dog’s way, Luke inadvertently walked up the bird. Since the dog was unaware of the flush, she was taken on and nothing was charged. At :29, the pair crossed over the mountain and headed for bird alley. Shortly after, Ice was seen standing, with extreme style, just inside the timber along the right edge. Dismounting to work the find, Mike Tracy called the flight of the birds with Judge Hailey confirming he saw two birds leave the area. At :40, Affair was at it again. She was standing high and tight out in the middle of a switch grass field. A lengthy flush ensued, and the relocation proved unsuccessful. Leaving the Bear trap area, the country opened up as the dog’s crossed below the pea patch and parking lot. Point was called at :55 near the end of the new cut with Affair pointing and Ice backing. After suffering her second unproductive, Luke reluctantly put Mae in the harness as her bid would end for this trial. Dan, on the other hand, was getting stronger. One hour and fifteen minutes in, he made a wonderful cast along the right edge past the potato patch and over the mountain. At 1:20, Great River Ice was gathered up and sent charging towards Dead Horse Curve. Making the curve, Ice was seen 400 yards to the front working with ease. Mike seemed to have a kite string on his dog as Ice was where he should be around every corner. With :03 to go, Mike put Dan at heel and gave him the “go” whistle for his final cast. Down the left side and around the big oak bend, Ice was still going strong as Judge Hailey called pickup. Great River Ice was seen under judgment deep to the front in the far right hand corner as Mike and Mark went after him. After a brief discussion with the judges, Johnny Taylor announced that the standby dogs were released and the winning announcements would be made in 30 minutes at the clubhouse. 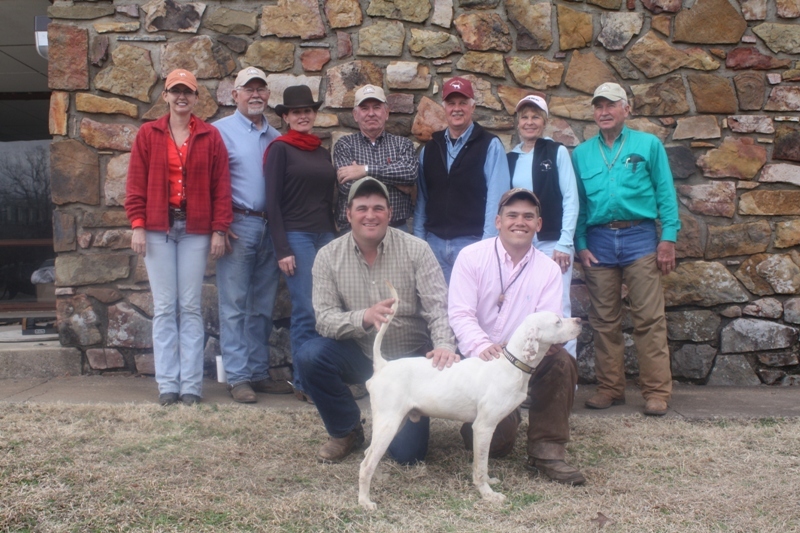 After the horses were unsaddled and tack put away, trial officials, judges, handlers, owners, and well wishers were in attendance as Johnny Taylor announced Great River Ice the 2011 United States Shooting Dog Invitational Champion. After the announcements, it was all hand shakes, hugs and congratulations for the next few minutes. Mr. Taylor then stated that the 2011 winner was quite possibly the most decisive winner in recent history. Over a three day period, Great River Ice was brilliant! He was intelligent, strong, and always on the front end over the 3 ½ hours of running. He adapted to each course and found birds during parts of the day when others failed. His bird work was always exemplary and without fault. The rapport between Great River Ice and Mike Tracy was special. Mike was able to ride in confidence and trust that Ice would be where he needed to be when he needed to be there. This display of confidence is something referred to but seldom seen. Those in attendance witnessed this type of communication for three days which led to Great River Ice capturing the 2011 championship!